Our thanks to members of our Integral Salon, who last night participated in a Dream Sociodrama in which we interviewed knives! The topic was, “What are your hopes and fears for the future?” Our protagonist was a young man who had a nightmare of escaping from a fire with his girlfriend into an elevator, only to find, once inside, that people were plunging knives through the metal, with the points coming very close to him from all sides! In Dream Sociodramas, the dream or life experience of the protagonist is treated as if it were one’s own. The element that is interviewed, in this case, the knife or knives, is experienced as our own. The usual questions of the IDL Interviewing Protocol are asked of the interviewed element, in this case, the knives, but not only of the protagonist, but of all group members, who serve as auxiliaries. 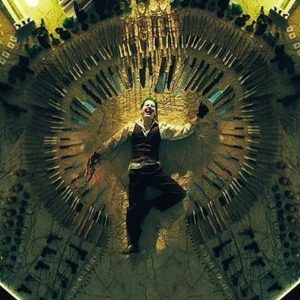 Therefore, we had a room full of knives, all of which had a lot to say. We had, for example, a samurai sword, a dagger that personified hesitancy, a Sword of Damocles, and a sword swallower’s sword, inserted! Each presented its own unique perspective on its role, strengths and weaknesses, and what aspects of its owner it most closely personified. Many knives chose to transform; that of the protagonist became first a poison cookie and then a beach with an elevator! It was fascinating to hear and experience how different knives addressed the life issues of their creators and what life issues they themselves would focus on. Most, in one way or another, moved away from drama toward some greater degree of objectivity. For example, the samurai sword was content to hang on a wall and only engage rarely, when needed: its owner did not need to be continuously engaged in conflict with others or within her own thoughts and emotions all the time! The Sword of Damocles brought equilibrium, as it was balanced above the head, and an utter disregard for the “scratches” of normal human relationships. Different perspectives represented different authentic approaches to addressing personal fears. They generated creative strategies that generated hope for the future in unique ways that spoke for each participant. The solutions that evolved throughout the process for others added perspectives that enriched everyone’s understanding of perceived life threats and how they could be recontextualized in ways that transformed them into important aids to addressing specific life issues of the moment for each participant. A core lesson that the evening taught was that what at first appears to be a threat or a Persecutor within the Drama Triangle to us, can reframe itself in amazing ways that move us from a position of victimization, or the need to escape into rescuing relationships or addictions, instead move us into very positive spaces of respect and honoring of the potentials latent within that which we fear. As a result, we stop running from our worries, anxieties and fears and instead learn to listen to them in a deep and integral way, and to test the recommendations that our interviewed emerging potentials make. By doing so, we not only grow in confidence of our own ability to stay out of drama, but develop confidence in IDL itself. For more information on Dream Sociodrama, go here.